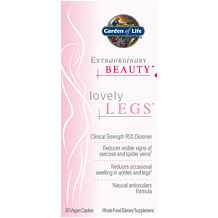 In this review we focus on a product called Garden of Life Extraordinary Beauty Lovely Legs. The maker of this product claims that it can assist with the health and tone of veins and capillaries in the legs, reduce the visibility of varicose and spider veins, enhance healthy blood flow and circulation in the legs, and relieve the aching pain associated with varicose veins. The manufacturer further claims that this supplement can reduce occasional swelling, water retention and the sensation of heaviness in the legs. Diosmin is used in the treatment of vein health, the anti-inflammatory properties in diosmin shrink problematic veins and restore normal vein function, promotes healthy blood flow and circulation maintaining tone and elasticity of veins, and provides optimal vascular health support. Cellulose and starch are used as an excipient in the pharmaceutical industry. Povidone acts as a disintegrant and tablet binder. 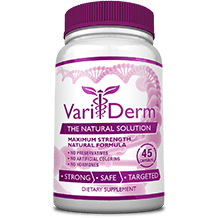 Clinically proven key ingredients such as Witch Hazel, Horse Chestnut, Butcher’s Broom, and Ginger are lacking from this formula which perhaps renders this product inferior to other products that include these ingredients. Take one capsule daily with water and preferably with food. The dosage instructions do not specify a preferred time of day to take the capsule. Consult your healthcare provider before use especially if you are taking blood thinners, anticipate surgery, or are under medical supervision. You can purchase this product directly from the manufacturer’s website where one container of 30 capsules costs $27.19. There are no discounts for bulk purchases or incentives for new customers. Shipping is an extra cost and is not specified until you have registered as a customer at checkout. We did not find a manufacturer’s guarantee or return policy for this product. We were encouraged by several factors about this product. The active ingredient Diosmin might be effective at treating some of the symptoms associated with varicose veins. We liked that the product is free from gluten, and dairy and is suitable for vegans and vegetarians. The product is let down in a number of key areas however. Clinically proven key ingredients such as Witch Hazel, Horse Chestnut, Butcher’s Broom, and Ginger are lacking from this formula which raises a red flag of concern as to the effectiveness of the product. There is no manufacturer’s guarantee or return policy for this product. The product is costly at $27.19 for a one month supply of capsules. Shipping is an extra cost and is not specified until you have registered as a customer at checkout. There are no discounts for bulk purchases or incentives for new customers. The dosage instructions do not specify a preferred time of day to take the capsule. There is only 1 review for this product on the company website. There is no assurance from the manufacturer that the product is made in an FDA certified facility, that it is free from binders and fillers, and that the ingredients are non GMO. For all these reasons we are not able to recommend this product for treating varicose veins.